These three temporary installations in the city precinct will encourage people to stop and spend time in places they would normally walk past. 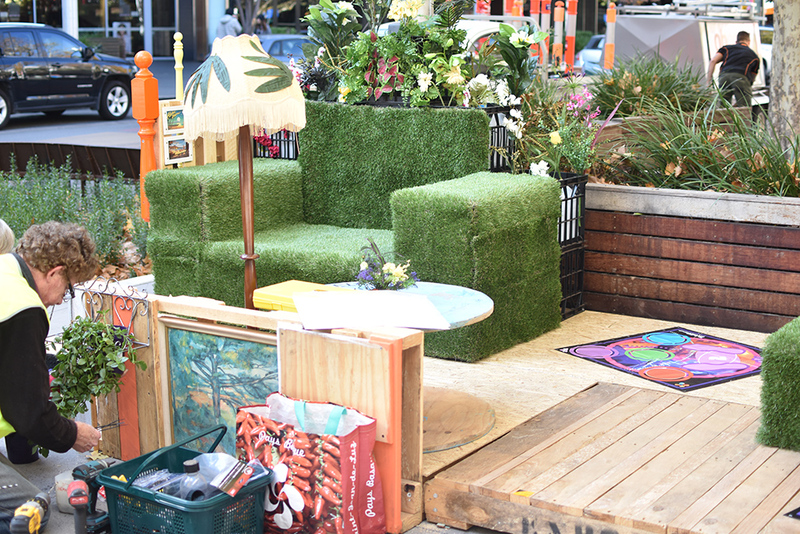 Supported by a City Grant from the City Renewal Authority, the Create-a-placeX3 project has created three temporary installations on Bunda, Genge and Londsdale streets, which will remain until the end of June. Local artists and designers Phil Nizette and Jennifer Jones of Wellspring Environmental Arts & Design have used pallets, crates, cable spools and quirky upcycled gems to create places for people to stop and spend time. City Renewal Authority chief executive Malcolm Snow said the installations would allow people to experience these parts of the city precinct in a new and different way. “We want people to really enjoy spending time in the city centre and giving them interesting and convenient places linger improves the experience,” Mr Snow said. This place making initiative is the latest work by Wellspring, which has been creating places with and for the Canberra community since 1996. Jennifer Jones said the work was partly an experiment and Wellspring was interested to see what happened when the public was invited to use spaces in a new way. “The design of each space is unique, with each one having a different theme that might reflect someone’s day-to-day journey,” Ms Jones said. “They provide some informal seating and give users a sense of being safe and cosy while they experience something a bit out of their ordinary environment.